The international community has begun to recognize the disproportionate impact of conflict on women and girls, and the necessity to include women in the prevention and resolution of crises. In 2000, the UN Security Council adopted historic Resolution 1325 – the first resolution on Women, Peace, and Security (WPS). Since then, the UN Security Council has adopted Resolutions 1820(2008), 1888 (2009), 1889 (2009), 1960 (2010), and 2106 (2013), which address sexual violence in conflict, and Resolution 2122(2013), which focuses on women’s participation, empowerment, and human rights. The scope and purpose of the WPS agenda and the Responsibility to Protect (RtoP) are different. Nevertheless, there are several ways they overlap and have the potential to reinforce one another. Firstly, gender-based human rights violations can serve as early warning indicators for atrocity crimes. Secondly, RtoP crimes and violations have a disproportionate impact on women and girls, and can amount to atrocity crimes as recognized in UNSC Resolution 2106. Thus, both agendas also work to strengthen mechanisms to prevent such violations from occurring. Additionally, WPS and RtoP seek to increase the recognition of women’s role in the prevention and response to mass atrocities. The following is the latest submission for the #R2P10 blog series. ICRtoP had the privilege of speaking to Laila Alodaat, a human rights lawyer and MENA Project Coordinator at Women’s International League for Peace and Freedom, to discuss the impact of the Syrian conflict on women. The Syrian crisis continues to show the detrimental impact that the spread of arms and the use of explosive weapons has on civilian populations. How has the widespread use of such weapons impacted women in Syria and what are likely long-term consequences? The Assad regime spared no effort to turn the peaceful uprising that called for freedom and dignity into an armed conflict. While brutally targeting pacifist activists, lawyers and political figures who were demanding civil and legal reforms, it also applied indirect measures like releasing extremist convicted criminals from prisons, turning the political seen into chaos. Such actions, combined with aggressive repression, abuse, torture and use of propaganda, resulted in civilians taking up arms as self-defence, a phenomena that later on turned into an element of the armed conflict feeding on the uncontrolled influx of arms to the country. Today, the increased militarisation and the proliferation of arms have devastating impacts on the structure of society and on the wellbeing of civilians who are suffering far beyond numbers of casualties. And while small arms have a devastating impact on women, the greatest threat still revolves around the extensive use of explosive weapons, which has been the main strategy of the Assad regime to impose corporal punishment on entire communities and to retain control of areas that fell out of its control. Since the beginning of the uprising in 2011, 53% of civilians died by explosive weapons. As a result of the Assad regime doubling the use of explosive weapons in 2014, over 35% of the death toll in Syria (76000 of an estimated 220000 casualties) took place in that year. Furthermore, almost half of the global casualty by explosive weapons in the world between 2011-2013 occurred in Syria. This has a devastating impact on women and girls, as 74% of the casualties are a result of explosive weapons and 17% of small arms. Beyond casualties, the use of explosive weapons in populated areas has a great impact on health care systems due to the destruction of infrastructure and hospitals, and a general fear of moving around in an armed conflict setting. This is particularly right in the Syrian context where attacks on health facilities and personnel by different parties to the conflict have become commonplace. A recent publication showed that between February 2014 and February 2015, at least 83 separate attacks on health facilities were reported. As for women, the lack of access to reproductive health can be a death sentence especially in places where maternal mortality is already high. No recent information on maternal mortality in Syria is available. However, the United Nations Assistance Mission for Iraq (UNAMI) stated that 80% of maternal mortality could be prevented by better access to health care during pregnancy, childbirth, and the postpartum period. We believe similar, if not worse, statistics are applicable to Syria. It is also crucial to mention that the survivors of explosive weapon attacks suffer from long-term challenges such as disability, psychological harm, and thus social and economic exclusion that have a greater impact on women in a society where they have less access, more restrictions and limited freedom of action compared to men. To what extent has the failing rule of law and rampant impunity in Syria disproportionately affected women and what issues need to be prioritized to address these matters going forward? During the armed conflict, the already shaky rule of law completely failed; firstly when the Syrian regime transformed the judiciary into a tool of repression through a combination of unconstitutional laws and emergency military courts, and secondly when it gave unlimited power to the notorious security branches that took pride in the horrifying reputation of torture, abuse and being the place where the best and brightest disappear. This failure resulted in more power given to arms and force against those who do not have access to it (women, children, elderly civilians, disabled people) or do not wish to use it (again women, ideologically pacifists, etc.) leaving them marginalised, disempowered, and with no access to justice. As the state completely abandoned its role in protecting citizens, constructing a fair society and ensuring safety and security, arms became the sole source of power and justice. And while they are only available to men, Syrian women were left with no power or protection and had to retreat quickly from being active right-bearers into subjects in need of protection by men, reaffirming masculine stereotypes that harms men and women alike. The empowerment of women requires recognition and criminalisation of gender-based crimes and a comprehensive approach to combat impunity for crimes perpetrated by all groups in control. Dealing with these crimes requires adapting a culture of reform, restitution and rehabilitation, rather than mere punitive justice. Only a victim-centred approach to justice will allow space for rehabilitation, social and psychosocial support, empowerment and growth for both women and men. Conflicts often force women to take on new roles and responsibilities as a result of the gendered impact of war and the commission of atrocity crimes. Can you explain how this has been the case, particularly with regards to the economic impact on Syrian women? It is crucial to adapt a viable political economy approach to understand the depth of women’s suffering in the on-going conflict. The Syrian conflict is yet another example of how women’s experiences of violence cannot be separated from the new roles dictated upon them by the emerging war economy. 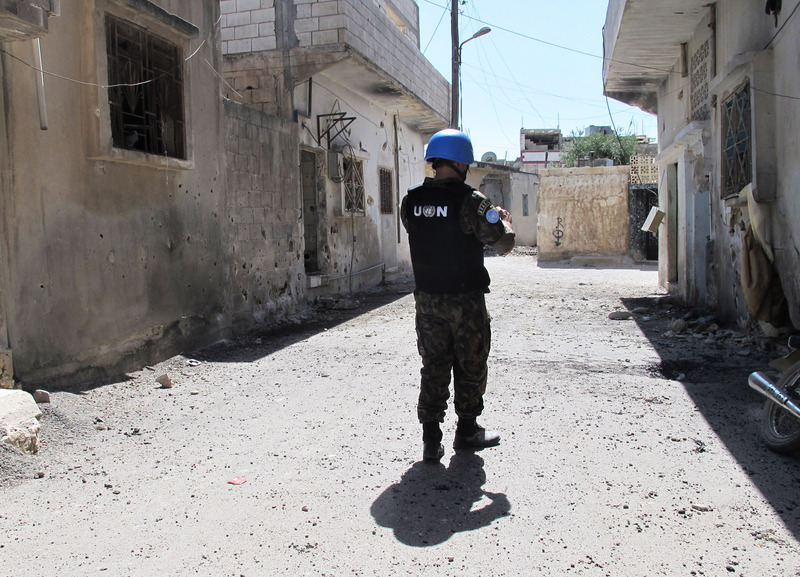 The Syrian regime’s targeting of civilians and civilian-populated territory with explosive weapons among other devastating means resulted in a widespread destruction of infrastructure. The enormous increase in military expenditures and the subsequent collapse of traditional income sources and local currency gave place to emerging war trades that enforced masculine constructions and resulted in a war economy that brought additional burdens on women. These women now bear new responsibilities as heads of household and primary carers for a large number of children, elderly and orphans while their rights to work, education and movement have been almost entirely compromised. Today, with 12.2 million people in need of humanitarian assistance, 7.6 million people internally displaced by violence, and 4 million registered refugees (statistics of the UN Office for the Coordination of Humanitarian Affairs as of March 2015) and only 15% of the required fund met (US$ 1,135,217,169 received of the US$ 7,426,692,851 required), Syria is a case study of the feminisation of poverty. Women form the majority of poor people not solely due to the lack of income or inability to work, but also due to the lack of access to productive resources and gender biases in law and practice. It is widely acknowledged that women are crucial actors in peace processes and that equal participation in such efforts is necessary to uphold the rights of all civilians and ensure the sustainability of peace agreements. That said, women remain disproportionately represented in efforts at all levels to prevent and respond to atrocity crimes. How have women in Syria organized to impact global peace processes, and how has the international community received such efforts? Syrian women showed great abilities when equipped with the space and choice. In January 2014, 47 Syrian women of diverse backgrounds and positions came together to set up the Syrian Women’s Initiative for Peace and Democracy with the aim of contributing to a peace process that ensures an immediate stop of the fighting, lifts the siege in civilian areas, releases political detainees and ensures effective participation of women on all levels of decision making as well as the negotiation process and transitional period. They have also offered to send a delegation to observe the Geneva II negotiation process and ensure that demands and experiences of Syrian women will be respected. The document issued by the Initiative proved to be the most inclusive, balanced and civilian-centred document since the Syrian uprising started, however, despite the tireless efforts of the initiative’s members, the consecutive UN envoys to Syria failed to translate their promised support into action. Hence, Syrian women continue to be absent from formal negotiations. The participation of women in opposition fronts also continues to be minimal and the concerns of women remain sidelined. This marginalisation has had devastating consequences, including the lack of gendered aspect in the emerging policy, absence of women experiences, and an emphasis on arming and militarisation vs. development, conflict resolution and peace making. What steps must domestic and international actors take in order to address the war’s impact on women and ensure women’s full participation in resolving this crisis as it wages into its fifth year? A sustainable peace in Syria cannot be achieved without the active participation of women and the incorporation of their perspectives at all levels of decision-making. We cannot afford to wait for a resolution to the conflict in order to start containing its devastating impact on women. It is imperative that all stakeholders stop compromising the effective participation of women at all levels, whether in constitutional and legislative councils, temporary or permanent local councils, judiciary, local courts, law enforcement and police authorities. 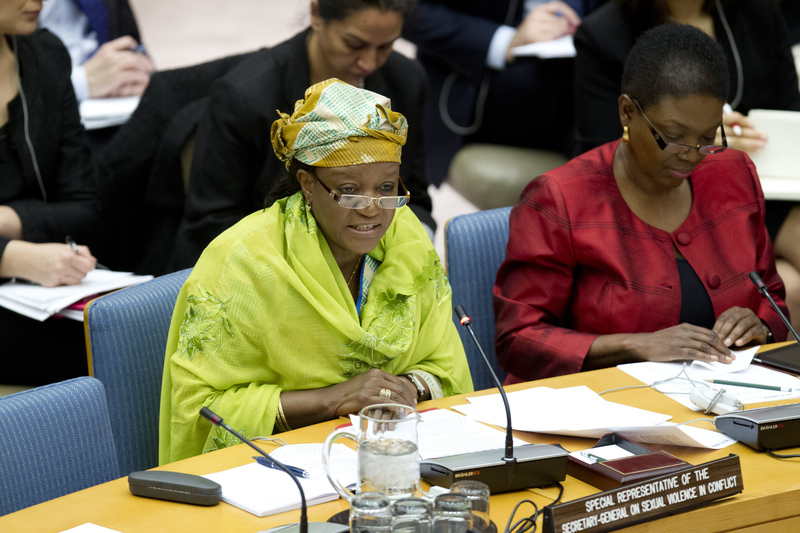 Zainab Hawa Bangura, Special Representative of the Secretary-General on Sexual Violence in Conflict, briefs the UNSC on the situation in Syria. National and international organizations must take women’s issues and experiences into account and act effectively to support and rehabilitate them to allow for full and substantial participation, whether individually or through groups and initiatives. This would also be in line with UN Resolution 1325, which calls upon all conflict parties to include women in the management and resolution of armed conflicts. Finally, the participation of women in solving the Syrian dilemma should go beyond mere token representation to focus on structural changes that allow space for women issues to be tackled, as well as for their opinions, and that of civil society and peaceful actors, to weigh as much as those of parties to the conflict.